Free Printable Robots Word Search. Free Printable Robots Word Search activity to share with all robots lovers and Robotics Enthusiasts at home or at school. Print this word search and try to find all the Robots related words. Have some fun with Robots and learn searching all the words in this activity. Great for robotics camp, after school, or just for fun. Find robots related words like Gears, Motor, Cables, Instructions, Build, Program, Technology, Coding, Bolts, Project, Science, Program, Computer, and many more. Select from 2 word search including 12 and 24 words each. Find the answers on page 2. 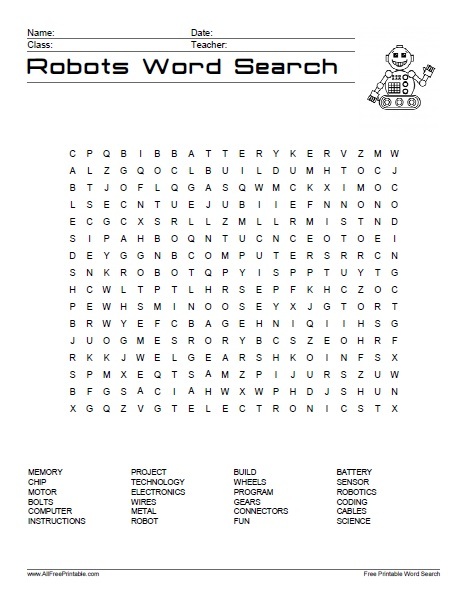 Robots Word Search Puzzle is ready to print in PDF format. Instructions: Click the print link to open a new window in your browser with the PDF file, then you can print or download using your browser’s menu.